Rhubarb intrigues me. As I was cutting up a stalk of fresh rhubarb, I was skeptical that it would work in this recipe. I kept thinking that I should do something to it first - like boil it, steam it or something to make it soft. Then I thought maybe I should cook it first with some sugar since it was bland if not slightly bitter. How on earth would it work out if I just threw in fresh diced up rhubarb?! It was as if I was chopping up a celery stalk and throwing it in. Needless to say, it worked... deliciously. In this muffin, the rhubarb cooked down and required no extra sweetener in this muffin. The strawberries provided the sweetness and the rhubarb added some moisture. With the muffin being moist and flavorful, the topping of granola put it over the top. I used the topping from an Ina Garten recipe and it really gave a nice contrast in texture... then again, I just like a crunchy muffin top. These muffins also freeze well! Preheat oven to 400 degrees and line muffin pan with liners. In a medium bowl, combine flour, sugar, salt and baking powder and set aside. In a large bowl, whisk together oil, egg, milk and vanilla. Slowly add dry ingredients and mix until well incorporated. 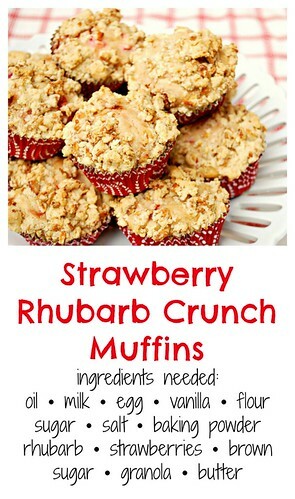 Carefully fold in strawberries and rhubarb into the batter and fill muffin cups half way to two thirds full. In a small bowl, combine crunchy topping ingredients using a fork or pastry cutter. Blend together until mixture is clumpy. Sprinkle tops with crunchy topping. Bake in the preheated oven for 20 minutes or until toothpick inserted into muffin comes out clean. I've never hard Rhubarb before but your muffins look delicious. I have heard of Rhubarb but never tried it before. These look tasty though! These look absolutely delicious! I've never cooked with rhubarb before, but these muffins sound so good! 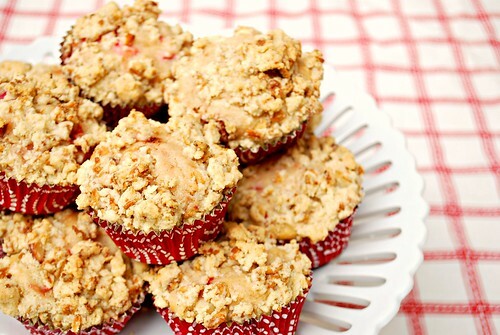 I've always been skeptical about putting Rhubarb into anything but those muffins look delish! mmm i so need to make these yum! These look so good and I just harvested the last of our rhubarb...perfect timing. Oh my gosh, they look delicious!! I honestly think it's the pectin qualities of the two fruits that make them work so well together. They just "gel"
I am firmly in the love it camp. I cannot get enough of rhubarb. I love strawberry rhubarb pie, and these muffins sounds like an awesome twist on that. I'll be trying these soon for sure!